Anti-cyclist attitudes amongst a minority of motorists in Darlington are well known. We have had many reports of aggressive drivers shouting and abusing cyclists on our streets. And I have previously blogged about the reaction to cyclist Norman Fay’s death on the Croft Road in 2008. Most traffic planners, and many politicians, in the UK blindly continue to encourage this kind of “the roads belong to us” attitude amongst motorists. But this shocking video from Porto Alegre in Brazil is in another league. It shows a motorist deliberately ploughing through a large group of cyclists. The incident took place last week during a Critical Mass Ride there. It has provoked a string of solidarity rides in Latin America, and indictment of the driver for attempted murder. It is not a video for the squeamish. 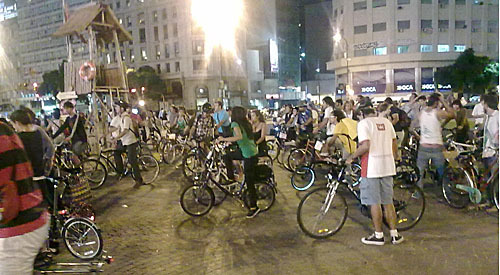 Critical Mass rides reveal the poverty of current traffic management thinking in countries like our own. Cyclists are expected to share road space with motorised traffic, but when there are enough cyclists on the road we suddenly become “an obstruction”. My own understanding is that “congestion” is the correct term, and that it is an issue at the top of the agenda for traffic planners to do something about – like providing better infrastructure. And I refuse to label this post “accident”! You can see more world-wide condemnation of the incident on Beauty and the Bike’s Facebook page. This is extremely shocking. No other words needed. This is the worst accident I ever seen in my life: There should be a hard punishment for the rough drivers so that one can not repeat such mistakes again. Well, that sort of attitude of car drivers can develop, when traffic policy tends to give them a status of first class in public space (i.e. on roads). Of course this guy is extreme, but in Britain there are a lot of very rude drivers. Most of them do not stop when they turn into minor roads even if a pedestrian is just crossing. Cyclists tend to be yelled at, cars pass them with high speed and do not give them enough space, thus frightening them with their back draft. A girl from the project "Beauty and the Bike"on a round about in Darlington was pushed by a van onto the kerb, she fell off her bike, the van took another extra round, opened his window and laughed at her lying on the ground. As long as transport policy in Britain does not start to reallocate the space on roads towards bicycles thus showing the motorist that there are other and vulnerable traffic members on or beside roads, nothing will change or will even get worse. many thanks, Brian. Will sort.